It’s time for another movie review presented by our good friends over at FatCats Gilbert on the southwest corner of Greenfield and Baseline! FatCats Gilbert is the best place to see all the latest hits at the box office like Star Wars: The Last Jedi and Jumanji: Welcome to the Jungle! To see all showtimes and to purchase tickets, you can click right HERE! Here in 2017, December means two things when it comes to movies: Oscar-bait and Star Wars. 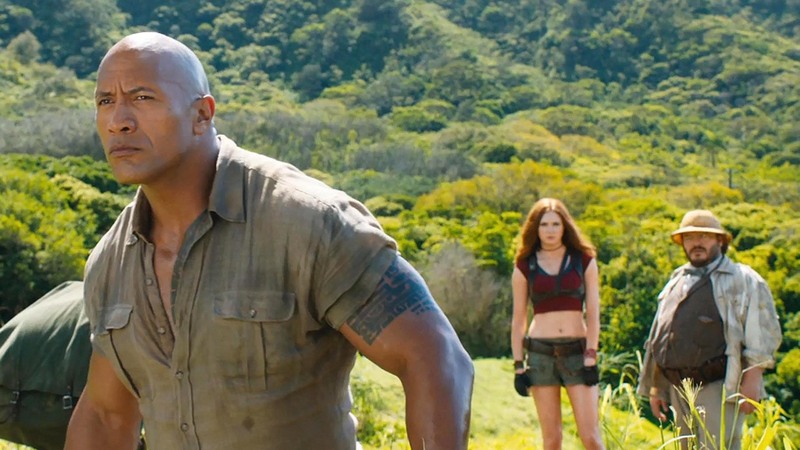 Jumanji: Welcome to the Jungle is neither of those. I actually liked the trailer to this movie, and I thought that it looked like a ton of fun. I also love the cast. I think Kevin Hart is a great comedian, but he still hasn’t made a great movie. I will say that I’m always excited to see Dwayne Johnson on the big screen. He’s almost always the best part of a movie, and I couldn’t wait to see him in this. I also have to mention that I’m not a huge fan of the original Jumanji. I don’t think it’s a bad movie, but I also don’t think it holds up well. I’m curious to see how many people are going to see this one, so let’s talk about whether they should or not! Jumanji: Welcome to the Jungle is directed by Jake Kasdan and stars Dwayne Johnson, Kevin Hart, Jack Black, and Karen Gillan. When four very different high school students are all sent to detention, they find an old video game console and cartridge tucked away in a box inside a storage room. After plugging it in, all four are sucked into the video game and into Jumanji where they have become their chosen avatars and must save the rainforest-like world from an evil man who has taken control of all of the animals. This might be the biggest surprise of the year, and I say that in the best way possible. I enjoyed this movie so much, and it’s actually one that I’d consider picking up for my own personal collection simply because of how much fun I had with it. I’ll start off with the performances because I thought that everyone in the film was fantastic. I’m not saying that anyone in the movie should be nominated for an Oscar or anything, but the entire cast knocked it out of the park. We’ve seen all of them in comedic roles, but they get to go against their typecasting in this, and I thought it worked perfectly. Dwayne Johnson is a skinny video game nerd who is completely enamored with how huge his arms are. I had a blast seeing Dwayne Johnson learn to mentally adapt to that body type with the personality of a kid who probably hasn’t ever stepped foot into a gym. As good as Dwayne Johnson was, Jack Black was probably the stand-out. His character is a typical popular high school girl whose life is justified by her Instagram likes. When she turns into, well, Jack Black, it’s easy to see why she would go through an internal crisis. Jack Black was so much fun to watch, and I’m glad to see him put his acting chops on display in a movie like this in 2017. 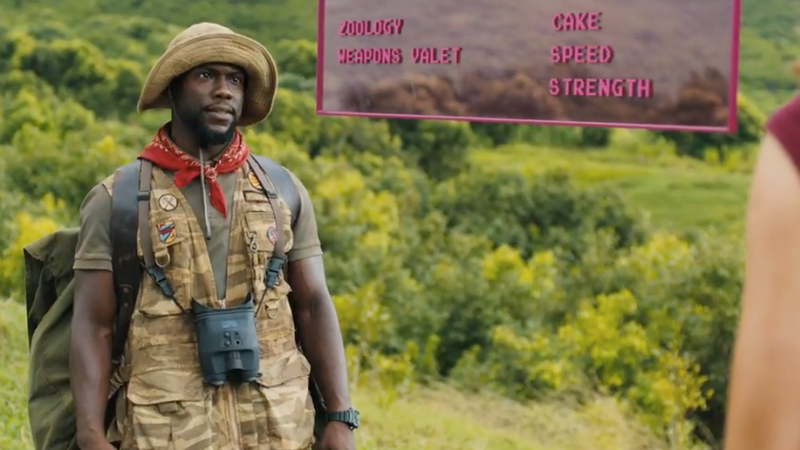 Kevin Hart didn’t wander too far away from what he typically does, but I still found him funny, and I thought that his chemistry with the rest of the cast was awesome. Karen Gillan is the last of the four main cast members, and I thought she was excellent in the movie, as well. Back when the first photos for this movie were released, many people were upset with Gillan’s costume. I think that if those people saw the movie, they’d get that it was so much more than just having Gillan wear the outfit. It completely goes against her character’s personality which is a quiet, socially awkward girl who has made the decision that she hates everyone. I also love what the movie did with video games. A lot of the comedy comes from seeing real people enter video games because things work so much differently than they do in the real world. Our main characters interact with the game’s characters who have been programmed to say one of three or four things, or they are forced to watch a cutscene, or they can tap their chest and see their strengths and weaknesses. For people who play role-player games or just video games in general, I think it’s a really fun take on gaming. I do have some issues with the movie. To a certain extent, the issues are somewhat inconsequential because Jumanji: Welcome to the Jungle isn’t trying to do anything special. It knows what it is, and it hits the points that it wants to make extremely well. That being said, the villain is pretty awful. Most video game villains, in my experience, are pretty awful, and the movie’s focus on the main characters more than makes up for it, in my opinion, but I didn’t even know what the villain could do. I think he could control animals. I know that he wanted a rock. Other than that, I’m really unsure as to who he was or what he could do. 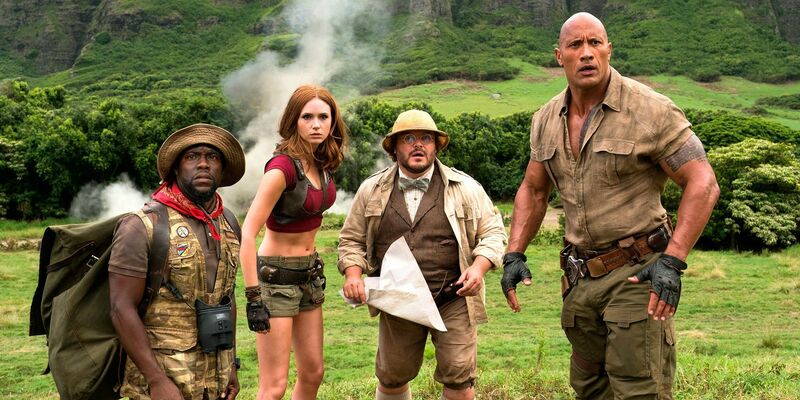 Bobby Cannavale gives a decent performance, but other than an expositional cutscene showing the history of Jumanji, there’s just nothing to him, and the internal conflicts amongst our main four characters are so much more compelling and interesting than the villain. Plot-wise, there are a few holes, but between the movie’s real intentions and how I have to suspend a little bit of disbelief given that the game sucked four people into a video game console, I don’t have any serious plot issues that I can’t brush under the rug. Overall, I would definitely suggest seeing Jumanji: Welcome to the Jungle, and I think it’s something that most of the family could enjoy. The casting is perfect, and it makes for some of the best comedy of the year. I also love how it tackled video games when it comes to features or things that seem somewhat odd to people who don’t play them but make perfect sense to those who do. I think Jake Kasdan did a great job directing some very exciting action scenes, and he used the characters really well to their weaknesses and their strengths. I’m still not completely sure what the villain’s goals or abilities were, and there are a few plot holes, but I think that the movie is entertaining and smart enough with what it’s trying to do that it didn’t really matter. I’m going to give Jumanji: Welcome to the Jungle a 7.3/10. Will you be seeing Jumanji: Welcome to the Jungle? Comment down in the comment section and let me know! As always, thank you, and keep listening to 88.7 The Pulse!